We have the largest selection of raw and fresh food diets for dogs and cats in the North Okanagan. Visit us in store to see our complete selection of raw foods and chat with our knowledgeable staff. We are here to help you find the best diet for your pet. Please find below some information about each of the raw food brands we carry and the benefits they offer. We are a manufacturer of high quality natural raw foods for dogs and cats. Our goal is quality and animal welfare. Pure and simple! Healthy, shiny coat with little or no odour. Cleaner teeth and healthier gums obtained through chewing on bones. Reduction in allergies and skin ailments. Better weight control – with raw food, keeping your pet at an ideal weight is just a matter of determining the food portion appropriate for their metabolism. No grains, fillers, chemical preservatives, hormones or antibiotics. That's irRAWsistible. No grains, fillers, chemical preservatives, hormones or antibiotics. We believe in feeding dogs and cats a wholesome diet of species appropriate foods. Fresh hormone free raw meats, offal, vegetables and fruits are highly digestible and will result in optimal absorption rates for your pets. Many dogs and cats have grain based allergies which often disappear when fed a species appropriate raw diet. At irRAWsistible, our balanced meals for dogs contain 75% hormone free meats and 25% fruits, vegetables & supplements. All of our 2oz & 8oz patties go through an instant quick freeze process and are frozen in 10 minutes sealing in freshness. Raw bones are an essential part of raw feeding. Raw meaty bones (chicken backs, turkey necks & duck necks) contribute to the correct calcium phosphorous balance in your pet’s diet. They also clean and strengthen your pet’s teeth. Our complete meals contain federally inspected, hormone free human grade meats, fresh fruits and vegetables and natural eggshell calcium. Simply put, we use biologically appropriate foods that are tailored to the long term wellness of your pet. Dogs and cats were designed to consume raw meat. Their digestive tracts and intestines are shorter and their stomachs have a high concentration of stomach acid. The best quality for your best friend! Meals for dogs are made up of 75% meat, organs and bone and 25% fresh vegetables. Our vegetable blends are also available packaged separately. 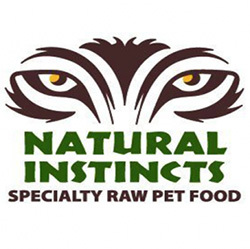 As with the Natural Instincts Meals for Dogs we vary the blends to provide variety for your dog’s diet. Varieties of meat with organs without any added supplements are available for those that wish to customize them for your pets specific diet. Most is free range and some certified organic or wild. Organ meat (heart & liver) is included in all varieties except Wild Salmon. Healthy skin and coat, cleaner teeth and gums, good digestion from natural enzymes, no bad breath, resistance to viruses, bacteria and parasites, firmer stools, increased energy, reduced allergy symptoms, better weight management, helps with arthritis. All varieties are supplemented with wild salmon oil (except Wild Salmon & Chicken), cod liver oil, natural source, full spectrum vitamin E and Dr. Dobias GreenMin (except Chicken, Turkey, Rabbit and Wild Salmon & Chicken as they contain ground bone). Chicken is also supplemented with free range egg yolk. All supplements are human grade. We use meat from inspected sources that is either ground or left whole. The ground meat is packaged and frozen for your convenience. For our meat and vegetable mixtures, raw meat is mixed with fresh fruits and vegetables and ground together to produce a 30% veggie, 70% meat blend. We encourage you to add leftover vegetables to your dog's meals. Reduced foreign matter from pet's digestive system. Wholesome raw food for dogs and cats. Primal Formulas are produced using only the freshest, 100% human-grade ingredients. Our poultry, meat and game are antibiotic and steroid free without added hormones. We incorporate certified organic produce, certified organic minerals and unrefined vitamins to fortify our complete and balanced diets. All Primal Formulas contain fresh ground bone for calcium supplementation. This combination of ingredients offers optimum levels of the amino acids (protein), essential fatty acids, natural-occurring enzymes, and necessary vitamins and minerals that are the building blocks for your pet's healthy biological functions. All of the ingredients found in Primal Formulas are procured from ranches and farms throughout the United States and New Zealand that take pride in producing wholesome raw foods through natural, sustainable agriculture. Primal Formulas offer you the convenience and benefits of a well-balanced, safe and wholesome raw-food diet without having to grind, chop, measure or mix the ingredients yourself. At Primal Pet Foods, we have taken the time to carefully formulate and produce a nutritious, fresh-food diet that is easy for you to serve and delectable for pets to devour.